Step 1. Decide what color stole you want to make. 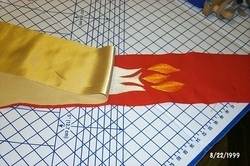 This will depend on the timeof the church year or event you are making the stole for. 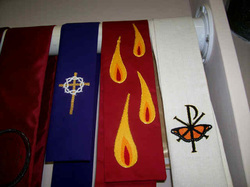 If it is an ordination stole, you will want a red stole. If not, you will want to pick the color of stole that goes with the same season of the church year. Below is a list of colors and their season or festivals. any day remembering a non-martyred saint. Any day remembering a martyred Saint. Advent depending on your church. You can put almost anything that would give glory to God on your stole, however, you may want to chose a design that would remind God's people what season of the church year they are in. For example, a Lenten stole could have a crown of thorns or nails. An Easter stole might have a Victorious Lamb or a butterfly to remind us of the resurrection. 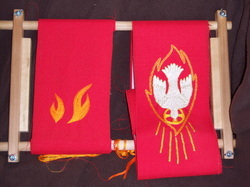 A red stole might have a dove and flames. You can chose any of our designs or supply your own. If you have an idea simply give us a call or send us an email. This is the part of stole making that takes the longest, but to me is the most rewarding. You can use any stitch that you want, but Sheri and I recommend using stitches that you feel comfortable with. My favorites are the popcorn stitch and the split stitch. If you are new to embroidery, try checking out a book at the library or finding someone in your family or at church to teach you a few stitches. When I first started, I had a scrap piece of fabric that I practiced my stitches on before I began on my husband's stoles. Step 4 : Wash and pin flat to dry if needed. No matter how careful you may be, sometimes things just get on your stole while you are embroidering it. in my home the culprits either have four legs or are very short. There is usually no reason to panic if the area surrounding your embroidery is a bit dirty. if you find you need to wash your stole at this stage, simply wash it gently by hand using regular laundry detergent. Next lay it on a large bath towel and roll it up like a jelly roll to dry it just a bit. Then you will need to pin it flat. I use my cardboard cutting board and pull and stretch the fabric so that there is no more puckering around the embroidery. Then I leave it in a room where no sticky fingers or curious canines have access to dry. Step 5 : Lay front and back pieces of stole right sides together. If the satin is wrinkly, you may want to iron it first. 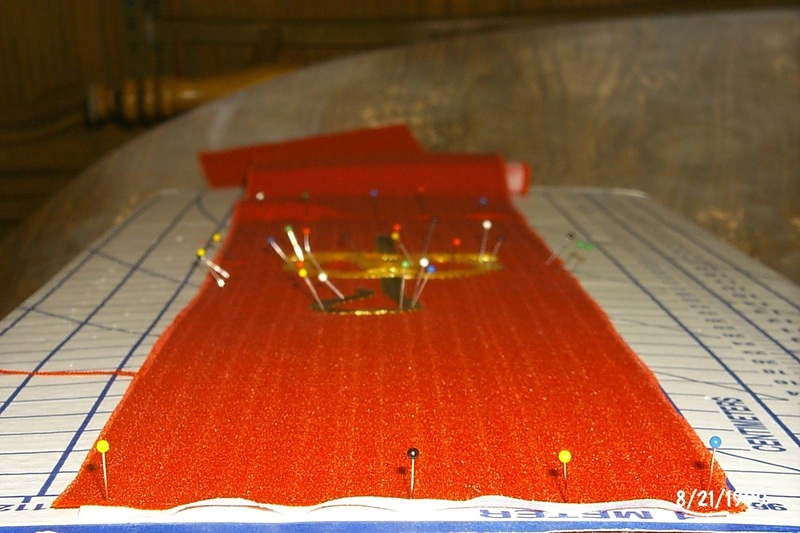 I usually have the pins running along the length of the fabric, but if you want to put them perpendicular, that would be OK as well. This step may sound unnecessary, but it is very important. 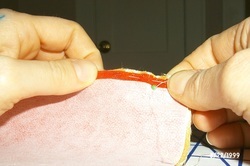 The satin backing likes to shift when it is sewn. If you omit this step, you may have a bunched up back to your stole. Besides, basting is easy. Just use any old thread (don't worry, you won't see it) and using big stitches sew the pieces together. Lay the paper pattern on the top of one of the stole sides. Pin it down and carefully cut around the black line. Be sure you do not cut the bottom of the pattern. I did that once to my husband's white stole. I cried. Sew right and left front sides together. Press the seams flat. One helpful hint with sewing the two satin pieces together is to put a pin further down the stole to keep the material further down from shifting. See the picture below. Using your sewing machine sew all the way around the stole leaving about a 3-4 inch hole for turning. This may be one of my favorite parts. It's like Christmas! Just push the inside part outside through the hole you left. To get a nice sharp corner, you may want to buy or borrow a turning tool. They are not very expensive, and I think the difference is worth it. Be careful with the temperature. The fabric is polyester, so you do not want to do any fabric melting. I find it easiest to press the opening you used for turning the stole at this time. Simply turn the fabric so it is even and press. When you get to the next step you will thank me. The blind stitch involves wiggling your needle back and forth inside where the seam would have been if you had sewn it with the machine. .